Axial SCX-10 owners no longer have to DIY their rigs to run on sand or snow - not when we now have our new Snow & Sandmobile Conversion for your 1/10 Axial SCX-10's available. 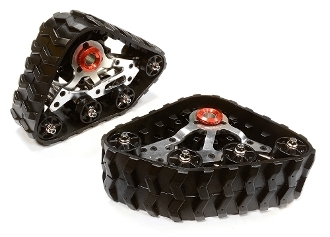 Now you're only a bolt-on away from taking your scale crawler over the snow, across the sand, and practically wherever you want to roll! Sold in pairs, the conversion features a tough anodized aluminum main frame, heavy-duty all-terrain treads, and specific mounting brackets. NOTE: These are sold in pairs; C26089 is for the FRONT only; part #C26090 is for the REAR only. You will need one pair of C26089 + one pair of C26090 for each complete chassis.